My passion for this series was ignited by the trades. Specifically, trades 1 through to 7, and then hopped over to the singles (from #43) when The Governer was about to take Rick and the prison compound apart. What the trades gave me was a real page turner, well over 100 pages of human drama, action, death, gore, and even a few zombies (it’s an old joke that The Walking Dead is a ‘zombie comic’ that actually contains very few zombies). Recently, being a nerd and being a bit of a completist, I went back and doubled up on my singles collection of Walking Dead and bought the trade counterparts. I read Volume 8 – ‘Made To Suffer’, a few months back and found it almost suffocating in its pull towards its downbeat ending. It is one of the most nihilistic, emotionally draining comic book experiences you will read. I would not compare it with Safe Area Goradze because that would be inappropriate – those horrors were real and happened in the 1990s and once you get to the middle section of the book, and the full horror of what went on is exposed, it is not easy to forget it. I would not compare it to Maus, because again, this was an attempt to tell a true story, with a different convention to ‘Safe Area Goradze’, but it was telling a history, demanding that as long as we remember the atrocities of the past, there is a chance that we can learn from that, become better and wiser from it. Maybe. I digress. Volume 8 of The Walking Dead is an immense achievement, a poignant, terrible story. I think it is Kirkmans & Adlards best work. I do not even know if Kirkman will ever better that run of issues from around 40 to 50, and specifically the ‘No-one is Safe’ arc. After reading Volume 8, I have recently read Volume 9, 10 & 11 in quick succession. 12 is in a small pile of books to be read over the coming weeks. What surprised me was the amount of coherence and great writing in the immediate aftermath of the events seen in ‘Made To Suffer’ – both 9 & 10 (aka ‘Here We Remain’ & ‘What We Become’ are great reads, that stand up better as collections than the jerky, episodic nature of the single issues. Having read volume 11 (aka ‘Fear The Hunters’) I was surprised how quickly it was over, and how the threat of the Hunters seemed a little tinny and hollow compared to the sheer force of evil that was The Governor. Anyway. What I am trying to say is that I really do think ‘The Walking Dead’ works better as a 100 page plus collection. Why? Well you get to issue 76, for example, as I have done tonight, and I just know that these pages will work better sitting alongside around 100 other pages. I like what Kirkman is doing with Rick, and it was good to see the phone make a reappearance, and I get it, i really get it, Rick is going mad – I know! And it is being handled with Kirkman & Adlards usual great qualities. But there is another trend becoming more apparent over the last few issues. It’s the verbosity. Some panels are full of Kirkman words that Adlards art is a footnote. And some of the dialogue feels like it could be a try-out for a screenplay. It feels stilted. The exposition just flows and then I find myself getting to a plot development amidst all the chat and realise that the plot has taken us round the houses and back to where we were before Rick went off his head in issue 75. Sorry if that is a spoiler, I may just be saving you the time to trudge through some of this to realise that very fact. Don’t get me wrong. I am not straying from the orthodoxy. I still love this comic. But this issue is just too wrapped up in Kirkman digging the look of his voice as words on a page, through the medium of Benjamin & Rick. It will make more sense in a trade. But I can’t shake the feeling that if I read this at least one more time I will still be left with the same impression. 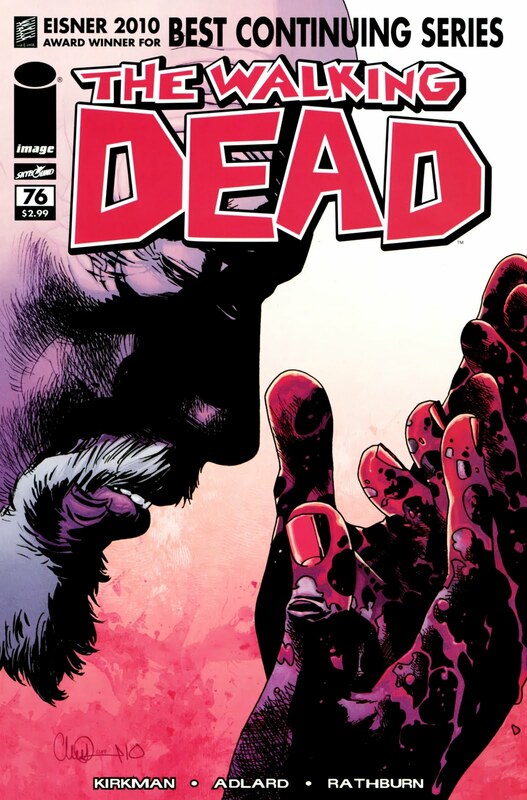 And that is that there are too many words in issue 76 of The Walking Dead. Too much talk, not enough doing.